Polk County offers a variety of public transportation options for traveling around the county and throughout the region, including a weekly shopping shuttle to Hendersonville, rides to area airports and pick-ups for travel to medical appointments. Safe, reliable, door-to-door service is offered throughout Polk County as well to Rutherfordton, Spindale, Hendersonville, Asheville, Spartanburg and Greenville. To arrange a ride, call (828) 894-8203 the day before by 10 a.m. for trips in Polk County and call three business days ahead for travel outside the county. Polk County offers a weekly Hendersonville Shopping Shuttle trip. Call (828) 894-8203 by Wednesday to make reservations for travel on Fridays to the Walmart in Hendersonville or to a limited number of shops within a 2-mile radius of Walmart. Rides to the Asheville Regional Airport, Charlotte Douglas International Airport, Greenville-Spartanburg International Airport and area train and bus stations are available through the Polk County Public Transportation System. Call (828) 894-8203 for round-trip or one-way costs and to schedule a ride. Trips to medical appointments outside Polk County are coordinated to make the most of available vehicles and drivers. Out-of-county medical appointments can be scheduled for 8 a.m. to 2 p.m., Monday through Thursday by calling (828) 894-8203. Seats are subject to availability. 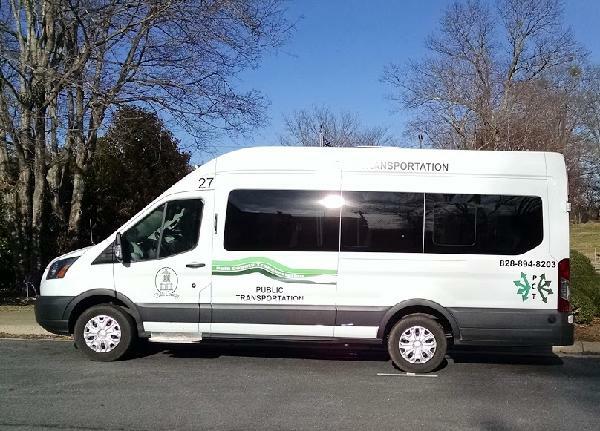 Funding is available to transport elderly individuals and people with disabilities as well as for citizens who need financial assistance for travel to medical appointments or work. Work-related trips such as to interviews and classes also may be funded. For more information, call (828) 894-8203 or visit the Polk County Dept. of Transportation webpage to print, complete and return the appropriate registration form. More about Polk County’s Public Transportation System including fares and payment information can be found on the Polk County Dept. of Transportation webpage.